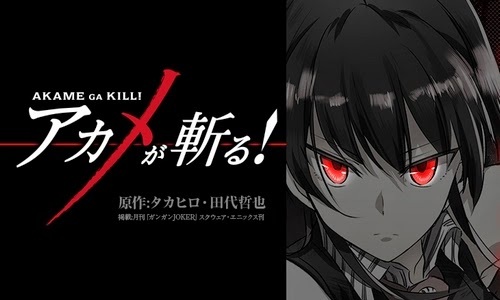 The final title licensed by Sentai Filmworks announced today was the soon to air in Japan Akame Ga Kill, which seems to be a serious action series. Again, never read the manga, so my opinion is based on the press release below. HOUSTON, July 5, 2014 – Weapons of war will clash in a bid to end an empire’s corruption in Sentai Filmworks' latest acquisition, Akame ga Kill! This supernatural action series is directed by Tomoki Kobayashi (Amagami SS+, Rozen Maiden), with series composition by Makoto Uezu (Humanity Has Declined, Devil Survivor 2), art direction by Yoshito Takamine (SoniAni – Super Sonico the Animation, Jormungand) and animation production by WHITE FOX (Is the order a rabbit?, Steins;Gate). Tatsumi, an eager young fighter who dreams of glory, arrives in the Imperial Capital in hopes of earning money for his impoverished village. His dreams are soon squashed when his attempts at recruitment are turned down, and his money is stolen by a curvaceous con woman. While stranded in the streets, Tatsumi attracts the attention of a wealthy family that offers to take him in. Just when it seems like things are back on track, Tatsumi’s would-be benefactors are attacked by a group of ruthless killers known as Night Raid. But the brutal assault reveals a darker truth that stretches all the way to the top, for beneath the thin veneer of the Capital lies a teeming hive of corruption that engulfs the whole city. With nowhere else to turn, Tatsumi joins the Night Raid to help put a stop to the wicked ways of the Capital once and for all. Akame ga Kill! will be available soon through select digital outlets with a home video release to follow.